In the most recent episode of Bad Voltage, I reviewed the Withings Aura Smart Sleep System. Tune in to listen to the ensuing discussion and the rest of the show. Long time listeners will recall I reviewed the Withings WS-50 Smart Body Analyzer a couple years ago. As I mentioned in that review, I’m someone who makes a concerted effort to stay relatively healthy. Part of that means exercising regularly and being cognizant of my eating habits, but as an Open Source tech guy, I’m someone who prefers to make empirical decisions. I like data. I like being able to spot trends and from there see if I can find causation. A large part of staying healthy is getting enough sleep, any studies have shown that many people simply don’t get enough. While I was interested in getting data about my sleep, having to wear a device to bed every night or remember to activate a device regularly is anathema to me. Enter the Withings Aura Smart Sleep System, which aims to track your sleep without any manual interaction. The Aura consists of two pieces: A plastic bedside device that serves as a control panel, speaker, digital clock, USB port and LED light that works in conjunction with the sleep programs and alarms, and a flat cloth sleep sensor that you place under your mattress. Once configured the device will automatically track and measure Temperature, Luminosity, Sound levels, Heart rate and amount of sleep. Sleep is broken up into light, deep and REM cycles which are then combined with time awake to give you a number for total time in bed, including how long it took you to initially fall asleep. The data is sent to the same Android or iOS Health Mate app as the WS-50, which syncs the data with the online portal. In addition to tracking, you can set a sleep program which combines soothing sound with a sunset light spectrum (which is various shades of red, from lighter to darker), use the nap program which allows you to sleep for a specific duration of time or set a traditional alarm. One nice alarm feature is that you tell the app not only what time you need to get up, but how many minutes before that you are willing to get up. It uses this data along with the sleep tracking to slowly start waking you using sunrise spectrum light (various shades of blue, from dark to light) and soft sounds once it detects you’re in the optimum part of your sleep cycle during that time window. You can even be woken up to a custom Spotify playlist. Once you’ve had the device for a while, the app and online dashboard start to build activity and sleep patterns. While it’s easy to see how much sleep you’re getting and what kind of sleep you’re getting, there’s unfortunately no attempt to explain why you may not be getting enough sleep or what actions you could take to try to improve your sleep. I should note that I initially had some issues with connectivity and the alarm function, but recent firmware updates seem to have addressed those. Withings has consistently improved the app and online control panel, and has added additional functionality (most recently Nest integration). The device retails for $299 with one sleep sensor or $369 with two. Roughly a week before this review, Withings was acquired by Nokia, so it’s too soon to know what long term impact that will have. So, what’s the Bad Voltage verdict? 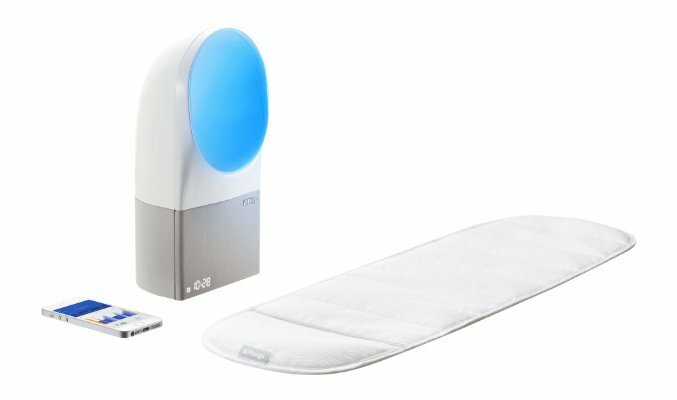 The Withings Aura Smart Sleep System gives you a lot of data and in my experience has been surprisingly accurate. The passive nature of the device appeals to me and ensures you have consistent and reliable data. While it would be nice if there was an attempt to further analyze the data and give customized actionable advice, you have the raw data to do this yourself. Overall the device works well, and if the concept appeals to you it’s something I’d recommend.